I moved to Utrecht (the Netherlands) in 2016 after a few years of nomadic life. By bike I explored all the neighborhoods in and out of the binnenstad, and the extensive waterways that lace the city intrigued me. I've always been magnetized to water, since I was a child in suburban Philadelphia, running off after school to play in the Valley stream and climb its trees. Several years ago I began to study Chinese geomancy, or Feng Shui. From my novice understanding of it, I know the energy of the waterflow in a river channel significantly influences the life of beings that locate themselves nearby. A location receives benevolent or disturbing energy depending on which side of a river bend one lives, for example. Utrecht was originally Tractium (place of crossing), a town of the Roman period. The settlement arose in the inner curve just downstream from where the Rhine and the Vecht rivers split, and the Vecht flowed to the north, while the Rhine continued west. It is part of the vast delta of the Rhine and Meuse that have drained the waters of the Alps and northern Europe for millenia. With canalization, the inherent energy of the Rhine was splintered into hundreds of pieces. It moves through and around the city, but slowly and not entirely under it’s own power. Living within touching distance of natural water most of my life, I find myself continually aware of the metaphor of impermanence that it symbolizes, even as its geographical story becomes an anchor for me in the world. Now that I find myself in a geography so intimately entwined with the element of water, it seems natural to explore these relationships between myself, humans, and water. 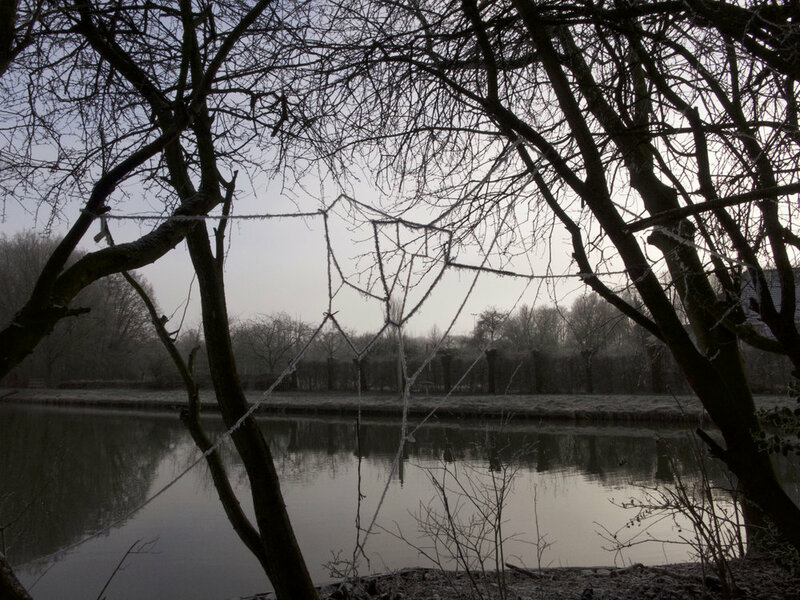 I live on the Leidsche Rijn, the trace of the original Rhine, between the Merwedekanaal and the Amsterdam-Rhine; between a waterway born in the time of my grandparents, and one born alongside my parents. All these family members have dissolved into another existence. I situate myself within the ground through which this water flows, the ground of impermanence. Dialogue with a River (2) - Oude Rijn (Leidsche Rijn). Site specific installation. February - April 2017. 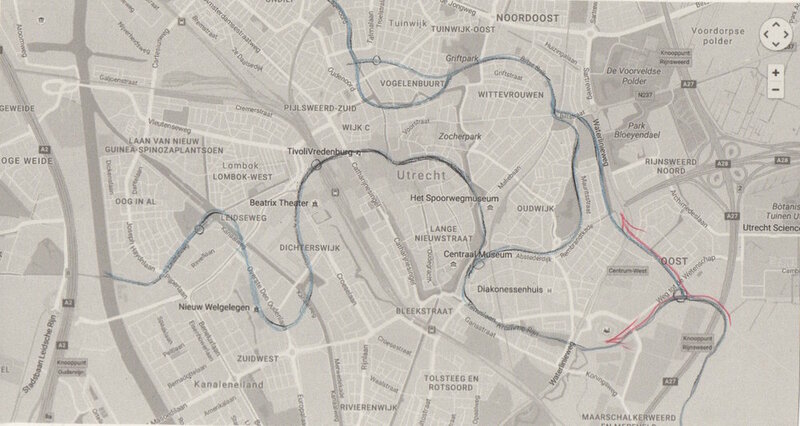 I began braiding the traces that the main waterways make around Utrecht today, installing the first "yarn map" at the location along the Kromme Rijn where it splits before entering the city. I locate places along the current water system where the trace of the original river lies underneath and install these maps there for a period of time, allowing them to be discovered by accident. Facing the river rather than the human observer, my maps communicate orientation to the water as it traverses the built environment. 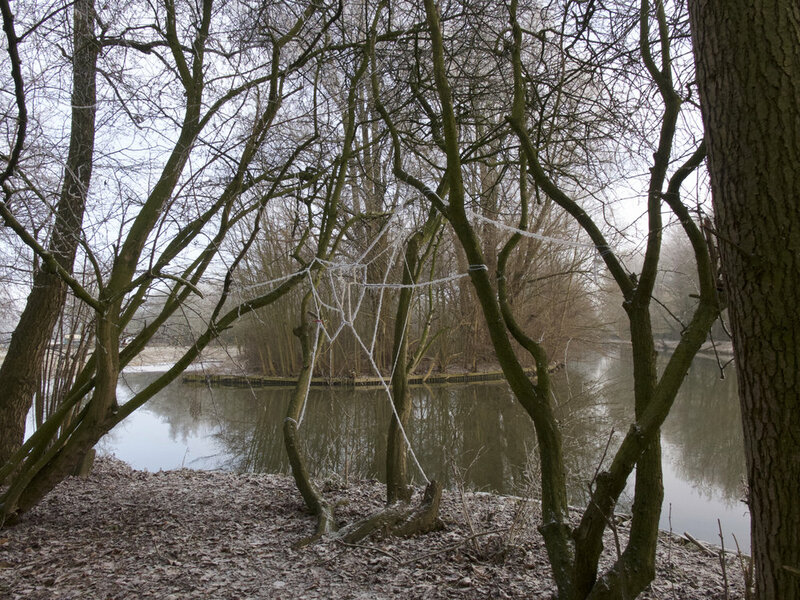 The textile makes tangible something normally experienced as ephemeral (water) - and the land where we stand becomes ephemeral space. The vertical suspension, like a web, captures the viewer in an estranged position - at first they cannot orient themselves in the work. They stand in empty space, temporarily groundless. 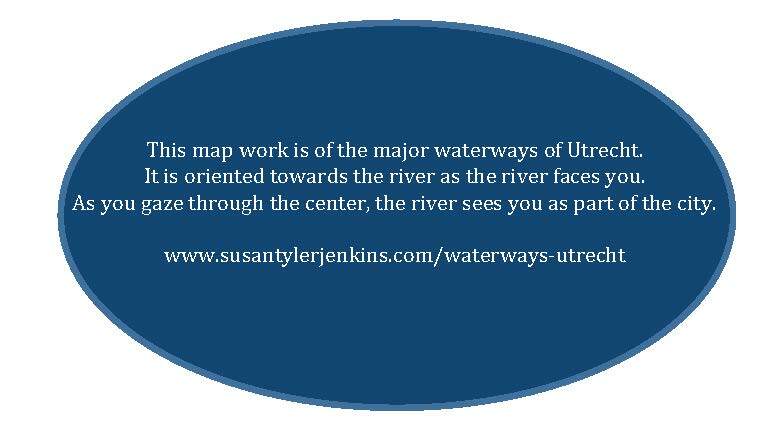 This map work is of the major waterways of Utrecht. It is oriented towards the river as the river passes you. As you gaze through the center, the river sees you as part of the city. Dialogue with a River (2) - Kromme Rijn. Site specific installation. January-April 2017. 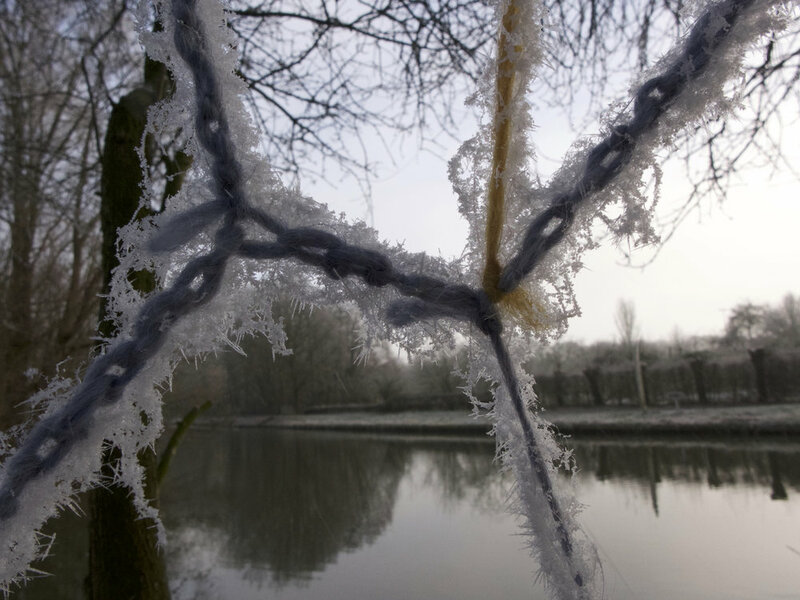 In incorporating a textile technique called macramé, where knotting is the primary form rather than weaving or knitting, I touch another old connection of humans with water. Macramé was practiced by sailors who used their knotting skills not only in securing the mechanics of their vessels, but also to augment and protect tools and objects, and to make functional things like hammocks and belts. Using knots creates three-dimensional form from something essentially linear - a length of yarn unspooling into space. My first key site along the old Rhine (Rijn) river is where it splits into two waterways just east of the city. 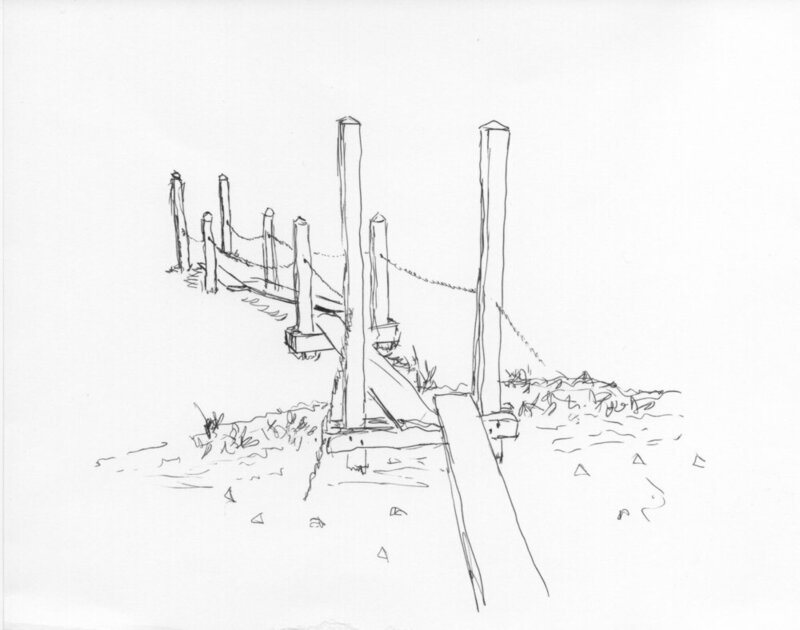 There is an island there reached by a footbridge (drawing) which has very old willow trees and a leafy niche just at the corner where the river divides. This location was the site of a group "tour" where I spoke about the geographic and plant history of the location and people were invited to silently wander and take in or interact with the environment in whatever way they were inspired. 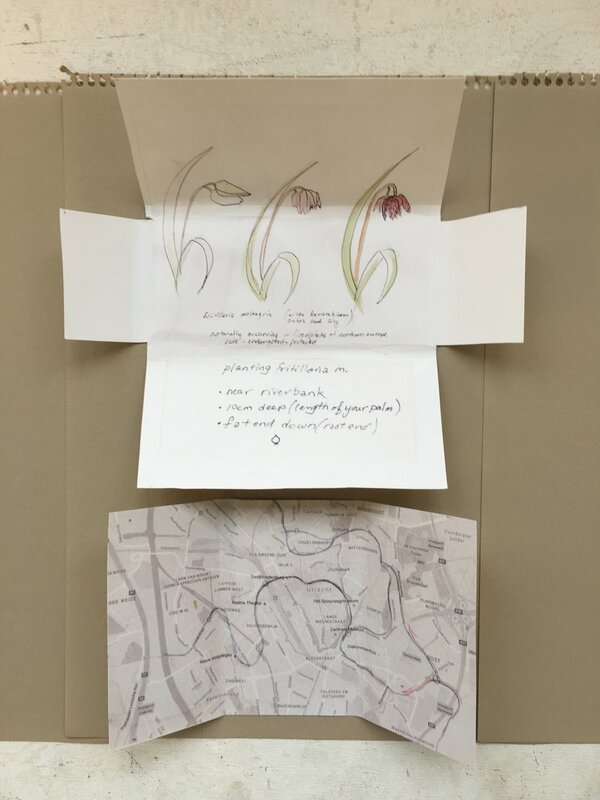 One option was to offer a planting of "snake-head" - fritillaria meleagris - an indigenous flowering plant that grows from a tuber (bulb) and is native to riverbanks in northern Europe.